One of my targets in 2015 was to complete a full marathon. Which was a target made without serious application, because I didn’t train for it. Terrible, I know, but it was a lesson I needed to learn. I was very fortunate that my target of doing a full marathon for the Standard Chartered Kuala Lumpur Marathon 2015 could not materialise when the event had to be cancelled due to the haze. There was no way I could have made the cut-off time of 6 hours. So when I saw the Park Marathon event, I thought that maybe I could actually fulfil this 2015 resolution. In its second year, the Park Marathon was a park-based run with 16 loops of 2.7km, totalling 43.2km. It turned out that like a lot of parks, Taman Rekreasi Bukit Jalil had plenty of elevations, which I was totally not prepared for. Luan had joined this event with me, and we went to the park together. It was a small event with only 82 participants. We were each given a timing chip, and our progress would be observed with a timing mat. When we signed up, we were to indicate our preferred cut-off time, which ranged from 4 to 7 hours. Of course, being new to full marathons, we chose the longest cut-off at 7 hours. Flagging off at 6am, it meant that we would have to run in the heat, up to the cut-off at 1pm. 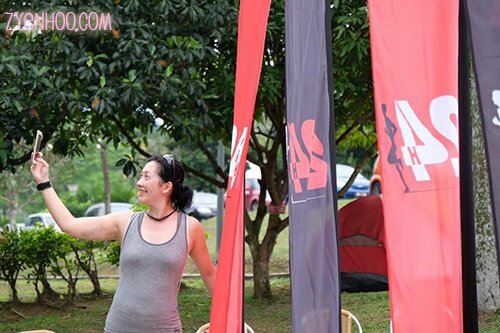 My knee had hurt me quite badly during the Bukit Cinta Ultra 2015, and I hadn’t found out how to overcome the issue yet. I brought my knee guards in vain hopes that they would help. Unfortunately, it didn’t. My right knee began hurting halfway through the run. The knee guards did nothing to alleviate the pain. Like at the BCU, I couldn’t run down the slopes anymore. I spent most of my time limping. I was going to stop, and I kept asking the organisers what happens if we DNF (Did Not Finish – meaning that we failed to complete within the cut-off time), to which they couldn’t seem to answer – because they hadn’t thought about it. To be fair to them, I think it was because they had expected everyone to complete the run, which was actually really optimistic of them. Anyway, all they could tell me was to keep going. So I kept going, and of course with the severely hurting knee, I couldn’t move faster than a crawling pace, and there was no way I could have completed the full 16 loops by cut-off. And I didn’t. When time was up, I had dragged my poor broken, limping body only over 14 loops – a sad distance of 37.8 km. I wasn’t the only one who didn’t make it; there were several others who also had mild injuries like myself who couldn’t complete the full marathon either. But the organisers didn’t let us go home empty-handed. They still gave us our finisher medals and head buffs, but only those who completed within their cut-off times got the finisher tees. It was not a bad event. It was just that I was disappointed in myself, as this was my first DNF event. I did not get to complete a full marathon, and I did not get to check it off my 2015 resolution. In fact, as I sat there washed over in my own shame and disappointment, one of the girls from the organising team (so sorry, I forgot your name!) sat next to me to chat with me, sharing her own disappointing DNF experiences, and tried to cheer me up. She encouraged me to keep trying, assuring me that I would improve in the future. Still, thank you to the organisers anyway for the event! It was actually a well-organised one, with the runners taken care of. Luan and I taking a photo with Yahya. The medals we were holding were actually the Xmas Virtual Run medals we joined to support Yahya who had organised it for a charity. Sea Pherng is just photobombing us here, haha.